WeatherFlow’s team of forecasters has decades’ worth of experience in monitoring and predicting the meso- and micro-scale flows that dominate the weather throughout the coastal zone. 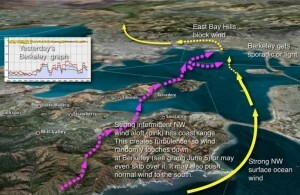 Integrating that experience with real-time data from the WeatherFlow Coastal Mesonet and our WF-WRF model, they have unparalleled success at generating highly accurate point forecasts for some of the world’s most challenging locations, including the Columbia River Gorge, San Francisco Bay, Hampton Roads, and others. Our forecasters blend in a unique mix of small scale factors to generate their forecasts, including topography, sea surface and air temperatures, currents, swell and wind waves, land and sea breezes, fog, and even tides to provide pinpoint predictions. In addition to our regular consumer applications, our forecasters have supported the Olympics, the Farr 40 World Championships, the America’s Cup, and other weather-sensitive events throughout the United States and overseas.